Windsurfing Boards & Windsurfing Sails - What Size? Following up on my last post giving a buyers guide to choosing windsurfing equipment I came across a very useful tool for figuring out what windsurfing board, windsurfing sail & fin size you should have. Whether you are just moving on from the learn to windsurf stages and trying to decide what your first windsurfing board should be or you are a seasoned pro trying to fill a gap in your windsurfing sails quiver, this interactive spreadsheet guide to choosing the right windsurfing boards, fins & windsurfing sails is really useful. Fire up the spreadsheet in Excel, choose the ‘Board Size’ tab & enter your weight in KG or lbs. Move across to the Windsurfing Sail Size tab, enter your wegith in KG or lbs. Move to the last ‘Fin Size’ tab, enter your weight in KG or lbs & sail size in sq metres. Adjusted sizes for – freeride, slalom, wave, formula & even sailing where there is weed! With all that data at your finger tips you should never be stuck trying to figure out what windsurfing kit you should be buying or sailing on! That’s really cool! …….. I’ll collate each sail size to the wind strength so I don’t have to dither and procrastinate. So simple. Great stuff. Glad to help. As you say, its so simple to get instant feedback on everything relating to sizing your windsurfing boards, windsurfing sails & fins. No more guess work. Thanks for the comment, its always good to here that people really appreciate the Top Windsurfing Tips & News that we provide. What’s the url to get this excell file?? If you look at the bottom of the file there are tabs for baord and fin sizes! Hey Chris, glad you figured out how to get to the fin size calculator. As you say, the info is split over different excel page tabs. 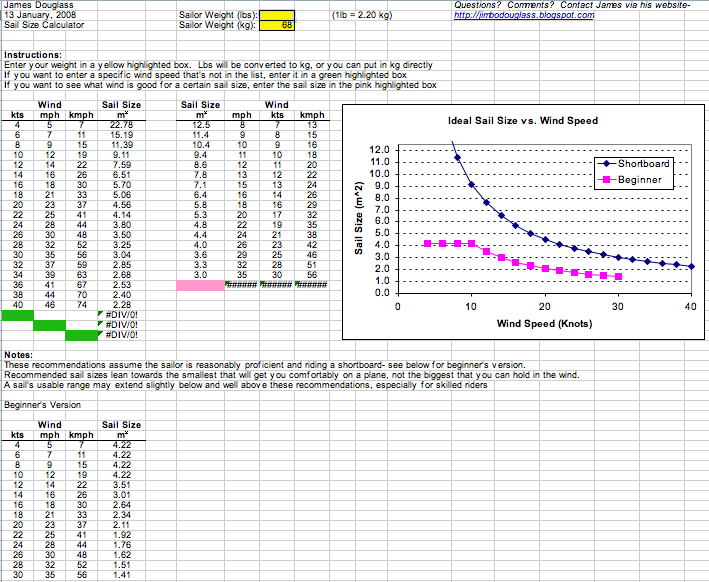 There is tons of info provided in this little windsurf board, sail & fin size calculation system – enjoy! Wow… quite amazing really. Thanks and well done. Taking the plunge after 15 years of hiring and in the process of buying lots of second hand kit, rigs, fins, etc…. off ebay and that. Lots of head scratching from all the possible variations and then you come along… fabbo! James – this is well handy. Glad to help, choosing the right windsurfing equipment can be a challenge at the best of times not to mention when negotiating the maze of the second hand kit market. A question about the software. When you use it against today’s boards it seems out of sync : basically all board recommendations are 15-20cm longer than what you would find om the market today where boards are classified more by width/volume. Perhaps the excel spreadsheet needs a little upgrade?? You could be on to something there, I will check it out. Board lengths have been getting shorter by the year & it would be good to get the formula working to account for width & volume. J’habite Goma à l’Est de la RDCongo, j’aimerai avoir le prix de la planche uniquement(le moins couteux et savoir s’il est possible de le faire livré? Hi, we specialise in windsurfing lessons & windsurf rental. We do not sell windsurfing equipment but rather offer free independent advice, such as in this article, to anyone who wants help in choosing the right kit. There are several good online windsurfing shops that deliver outside of the UK. Just type in the name of the windsurf board you are looking to buy into a Google search and it will bring up such online retail shops. Hope that helps you out. Seems a bit on the small/low side, but def a cool guide. Lukasz – Sorry for the delay in replying but yes you are absolutely correct. Luckily the actual formula is the right way round and it was just the explanatory note that stated the conversion the wrong way round! I have now corrected the wording to avoid any confusion. Thanks for the heads up.